Oracle ADF version 12c runs on Java EE 6 container Weblogic 12c. 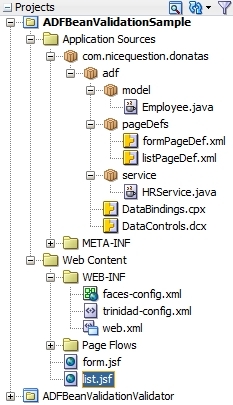 ADF Faces 12c (current version 12.1.2) is based on Java Server Faces 2.1 standard. Version 2 of JSF introduced support for Bean Validation , as described in JSF specification ( Chapter 2.5.7). To summarize: it basically states, that java bean properties , annotated with Bean Validation constraints, are going to be validated automatically by the underlying JSF implementation. ADF as Java EE (and therefore JSF) standards based framework provides an extended functionality with a special focus on productivity and declarative development. An example of such functionality is ADF Binding Layer, which helps to access a data from user interface a unified way. The blog post provides a sample implementation of ADF BeanValidator to close a small integration gap between a functionality specified by JSF and ADF (specifically ADF binding layer). Note: the usage of Bean Validation might provide most benefits in case your ADF usage scenario includes an alternative to ADF Business Components, like EJBs or Webservices In case of ADF "full-stack" usage there might be no benefits in using Bean Validation comparing it to integrated validation functionality available in ADF. Lets have a look at the structure of the sample application, available to download and run in JDeveloper 12c (12.1.2). The first project ADFBeanValidationSample is a simple ADF Application supposed to be used in a business area "Human Resources" at some company. I will describe a structure of it and the steps used to create it very briefly. The model consists of one java bean Employee.java with 2 properties: id and name. The properties are annotated with JSR 303 Bean Validation constrains: @NotNull and @Size. The constrains supposed to make sure, that values for both properties are provided and size of a name fits into a boundaries defined. Two JSF pages (list.jsf and form.jsf) with bindings to HRService.employeeList were created in JDeveloper usual declarative way (Drag&Drop . It looks like we are dealing with some early-stage startup with two employees :) Lets hire a new one. JSR303 Bean Validation constraint @Size(min = 3,max=20) on a property name in a bean Employee.java kicks in. Unfortunately we can't submit the data of our new hire at a moment. We "tune" our business rules and fix our business model Employee.java this way: @Size(min = 2,max=20). Mr. Wu is able to join our company as a result of our efforts. Lets look at the second project ADFBeanValidationValidator for the implementation details. Note: early ADF and Bean Validation integration is also described in a blog post of Romel Pino. The second project ADFBeanValidationValidator (configured as a dependency) , provides ADFBeanValidator.java to close a gap between JSF and ADF binding layer. Therefore it gets attached to every UIInput element and gets executed on a validate phase of JSF lifecycle automatically without additional configuration and development efforts. Delegates to standard BeanValidator - validates a property. Restores an original ADF value expression from a backup. ADF binding expressions don't work because they resolve to a Map interface. And a Map is not validated by a standard JSF BeanValidator. In order to compensate that we can get a functionality of Bean Validation in ADF Project simply by including our ADFBeanValidator as a dependency. A complete source is also provided at Github.